A truck with a topper usually has somewhere to be, and mostly that place is work. Toppers are great, but even those can't carry the biggest loads. The Rhino Rack HD topper racks are designed to offer optimal carrying capacity, which is perfect for carrying long ladders, and anything else that won't quite fit inside the truck cap. Rhino Rack HD topper racks are available in 3 different styles including the track mount topper rack, the no track mount topper rack and the pad mount topper rack, as well as being available in your choice of black or silver. The Rhino Rack track mount topper rack is a permanent fix to either a hard top tonneau or a truck topper. This system uses a heavy duty silver bar with tracks. This track rack is great because it allows for crossbar movement to fit your load. It offers a 63" track as well as 50", 54" & 59" length bars. The Rhino Rack no track mount topper rack is designed to fit onto already placed Thule and Yakima tracks. This is a great option to have for those of you who already have a track mounted. It is featuring 54" & 59" length crossbars. The Rhino Rack pad mounted topper rack is offering a unique design. They bolt down to the top of toppers and offer an ingenious internal backing plate, which hides the hardware underneath. Available in 50", 54" & 59" length bars. This selection of Rhino Rack topper racks are designed to allow optimal load capacity, which maximizes the potential of your ride. Made by Rhino Rack, you can rest assured that these guys are built to stand the test of time. Get a set today, you're not going to regret it. The Rhino Rack HD topper racks offer an easy installation with minimal drilling required. For please call us at 1-877-216-5446 or 701-253-5906. The Rhino Rack track mount topper racks simply bolt down to the top of a hard top tonneau cover or a hard resin top roof, then simply slide the crossbars into place. The Rhino Rack pad mount topper rack is going to bolt down to the top of your topper. Simply place pad under rack mount and put bolts through applicable area. Slip the interbnal backing plates over the underside and bolt down. 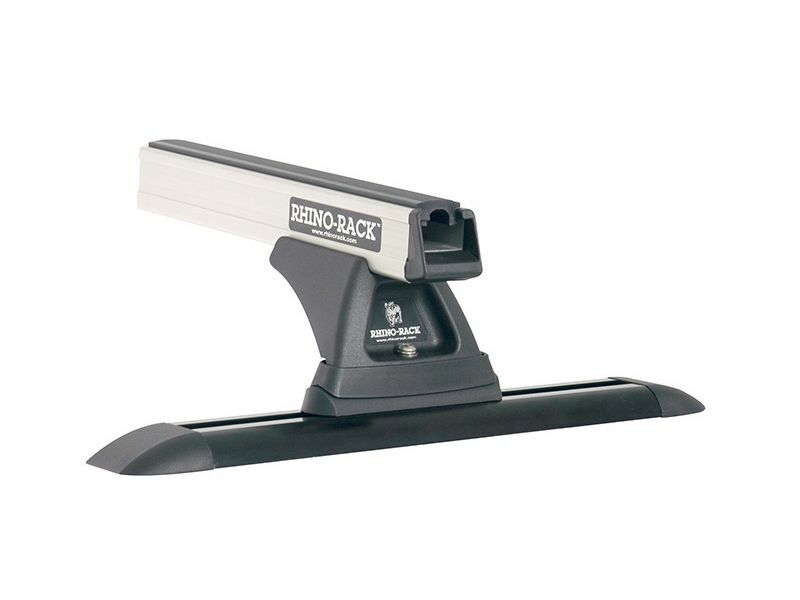 The Rhino Rack no track topper racks offers a no drill install. Just place the cross mount legs and crossbar in the track and place where needed.